A balanced and sophisticated analysis of the true costs, benefits, and consequences of enforcing drug prohibition is presented in this book. 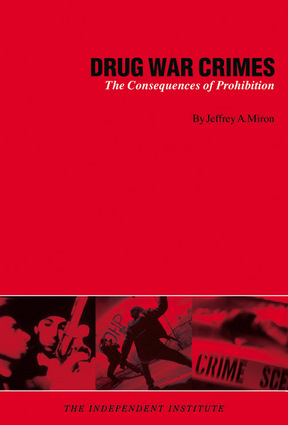 Miron argues that prohibition’s effects on drug use have been modest and that prohibition has numerous side effects, most of them highly undesirable. In particular, prohibition is shown to directly increase violent crime, even in cases where it deters drug use. Miron’s analysis leads to a disturbing finding—the more resources given to the fight against drugs, the greater the homicide rate. The costs and benefits of several alternatives to the war on drugs are examined. The conclusion is unequivocal and states that any of the most widely discussed alternatives is likely to be a substantial improvement over current policy. Jeffrey A. Miron is a professor of economics at Boston University. He is the author of The Economics of Seasonal Cycles and Casebook for Use with Macroeconomics. His opinion pieces have appeared in the Boston Business Journal, Boston Herald, Boston Globe, and London Guardian. He lives in Boston, Massachusetts.